February 1st just passed and already the first sign of spring has arrived with daffodils emerging from the still slumbering earth. 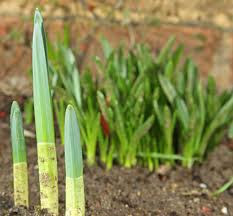 A mild winter in the Northwest but we are still only half way to the Spring Equinox. Tomorrow is Imbolc which originated within the pagan tradition and is one of the cross-quarter days which falls between the Solstice and the Equinox. The day also became associated with the Celtic goddess Brigid, the Celtic goddess who in later times became revered in Christianity as St. Brigid. Originally, Brigid’s festival was known as Imbolc or Oimelc, two names which refer to the lactation of the ewes, the flow of milk that heralds the return of the life-giving forces of spring. Later, the Catholic Church replaced this festival with Candlemas Day which is dedicated to the Virgin Mary and features candlelight processions. The powerful figure of Brigid the Light-Bringer overlaps both pagan and Christian celebrations. I love finding these threads between our earth-honoring ancestors and our religious traditions (and the intention behind my artwork) because I believe humanity must remember and reclaim these ancient roots to begin reverencing the earth in such a profound way that we (in developed countries) choose to walk more lightly upon the earth in order to ensure a liveable future for all beings…and for other species! In secular culture this time of year became known as Groundhog Day–which was a big deal growing up in New Hampshire where the winters were fierce and we kids yearned for the sun to return so we could play outside again. Growing up, I did not know this yearly visitation of the groundhog had its roots in the ancient ways of our ancestors. Imbolc was a time to start preparing the fields for the first planting and to bless the crop seeds saved and stored from the last harvest. This is the time for purification and renewal. Today, we might begin to till our actual gardens but we can also symbolically till the soil of our souls by letting go of something (or some action) that no longer serves us and plant a seed of intention to bring into our lives what we most want to harvest this year. This year I’m feeling a pull outward, which is in stark contrast to my introverted nature, so am setting an intention for more adventures. This may include travel to some regional conferences with my artwork and/or to offer workshops around these themes. Growth and opportunity are abundant in this landscape. During the winter season, we rest in the darkness of the womb and the sun will now purify and bring energy and light to a new vision for ourselves and our world. What are you longing for? What would you like to see bloom more fully in your life, your work, your relationships? Plant the seeds of intention now, nurture the ground, and harvest the gifts as we journey through the cycles of the seasons in the coming year.